I’m a big fan of Gordon Ramsay’s Union Street Cafe in Southwark, so when I heard of another new opening, I had to get in quick. Okay, so Gordon doesn’t actually work at these places (not that he’s pretending he is), but I have no issue with this as he does seem to have the knack of nurturing really good head chefs. At Heddon Street Kitchen it’s Maria Tampakis at the helm. 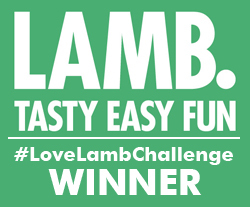 She hails from Brooklyn in New York, is part of a large Greek family (so has spent a lot of time in Greece, lucky her) and she describes the offering as “seasonal modern European food spiked with Asian influences”. So far so good. To make matters even better, the restaurant is on one of my very favourite streets in London. Heddon Street is a minute off Regent Street but tucked away enough that you’d have to know it’s there to find it. This little oasis (aka Regent Street’s Food Quarter) has several bars and restaurants all with decent alfresco areas. Heddon Street Kitchen is open all day, ideal to pop into at any time to get away from the hustle and bustle of Regent and Oxford Streets, especially at this time of year. I headed in for lunch, only three days after it had opened. It’s a modern, glitzy sort of space with booths along the large windows and a welcoming feel. And the menu offers a comprehensive selection of starters (hot and cold), salads, mains and grills which are one of its specialities. This starter could well be the best one I’ve eaten all year. It’s like a sophisticated veal tonnato, one of those dishes that sounds really strange but actually the combination of flavours is something spectacular. 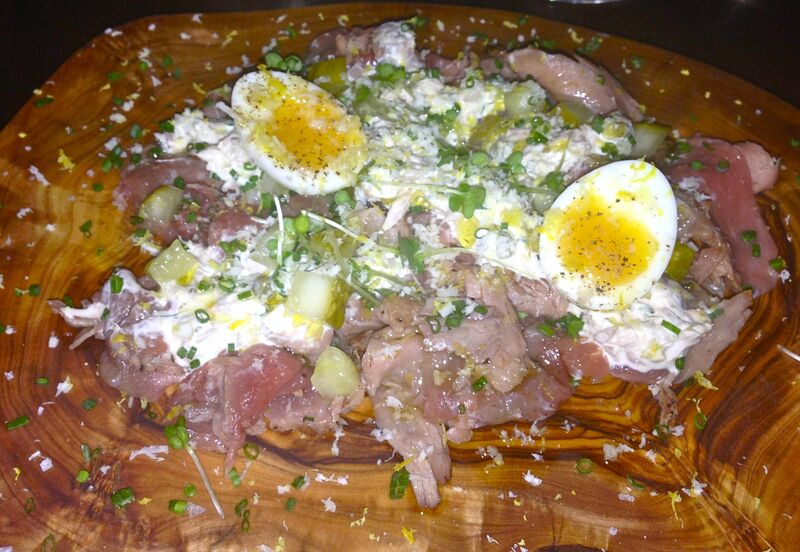 Roasted veal carpaccio, dill pickles and quails eggs with a tuna dressing. 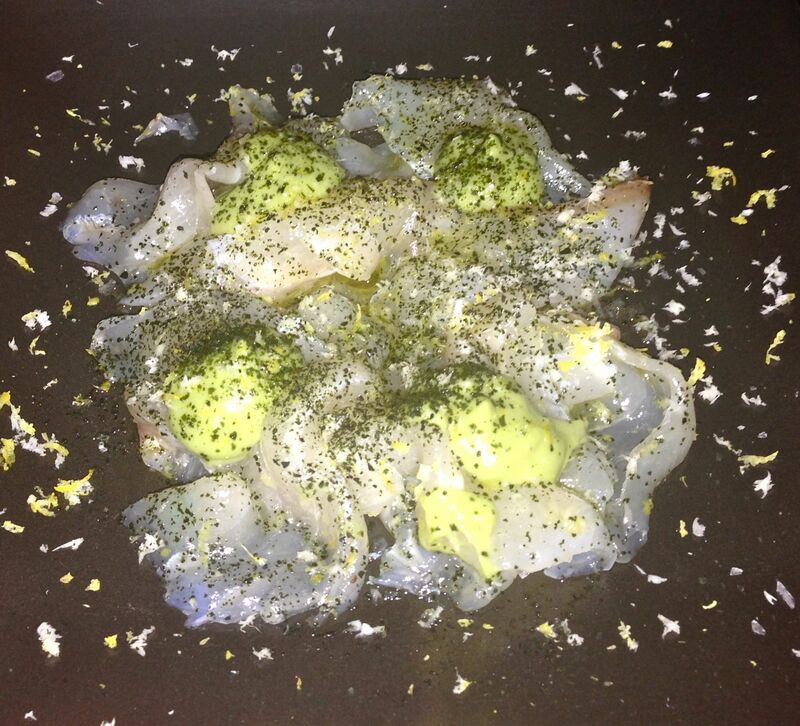 The stone bass fillet carpaccio was topped with perfect avocado puree, horseradish and ginger. The avo puree and fish simply melted in the mouth. I love a good pork belly dish but have pretty much given up ordering it in recent times after too many disappointments…soggy crackling, dry overcooked meat, too many clashing flavours in the sauce. Today I spotted the best-looking pork belly on the table next to me. Such a perfect dish when it’s done well like this one was. 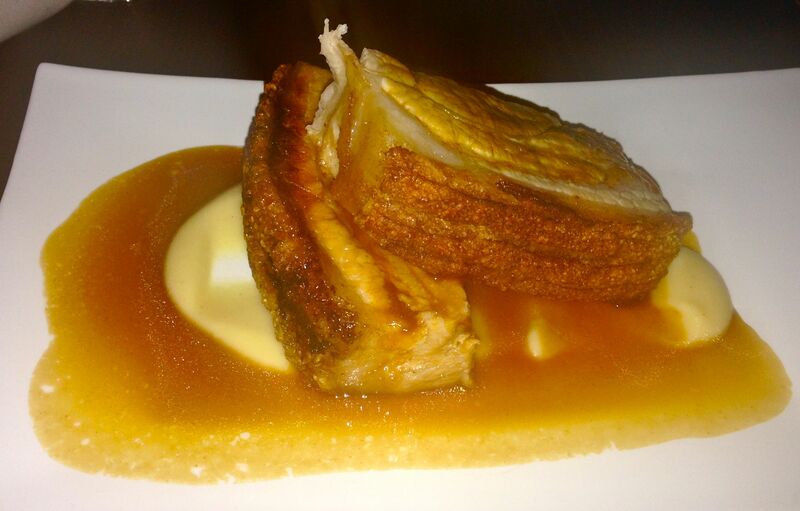 The slow-roasted Saddleback belly was served simply with gravy and apple sauce and cooked to the ultimate tenderness with the most flavoursome of crunchy crackling. It was so good I’m thinking my new ordering strategy should be to check out the surrounding tables and pick whatever looks the best. Worked like a charm this time. 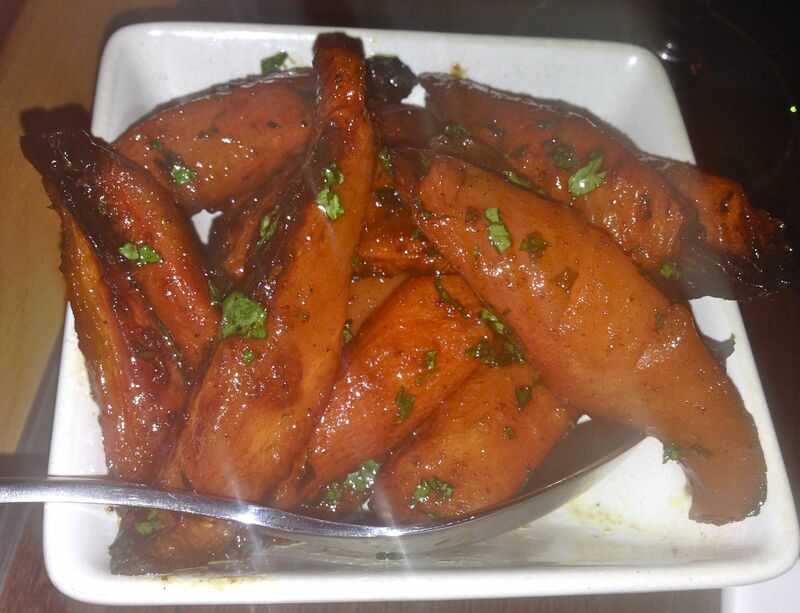 With such a meaty dish there was a need for some veg…these spiced honey carrots were beautifully sweet and spicy with a bit of crunch. 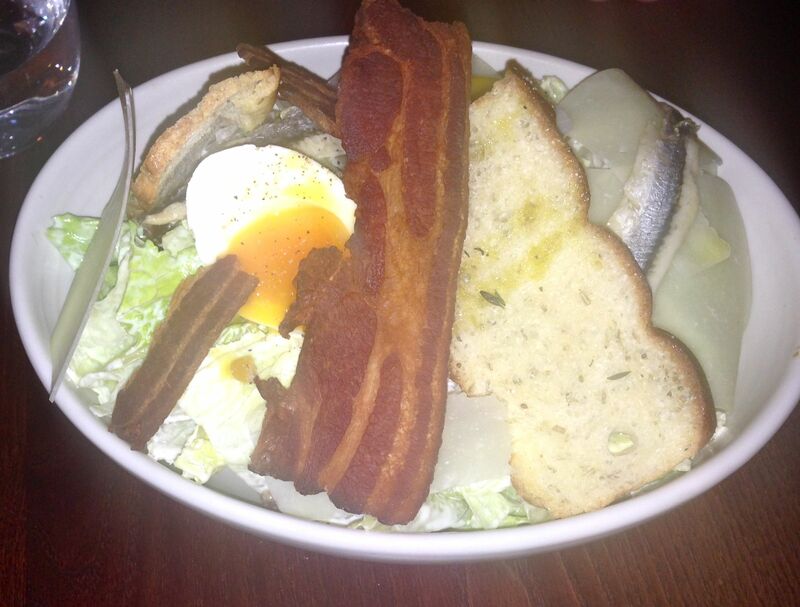 The Caesar salad came with pancetta, anchoves, soft boiled egg and aged Parmesan. A classic to tuck into. 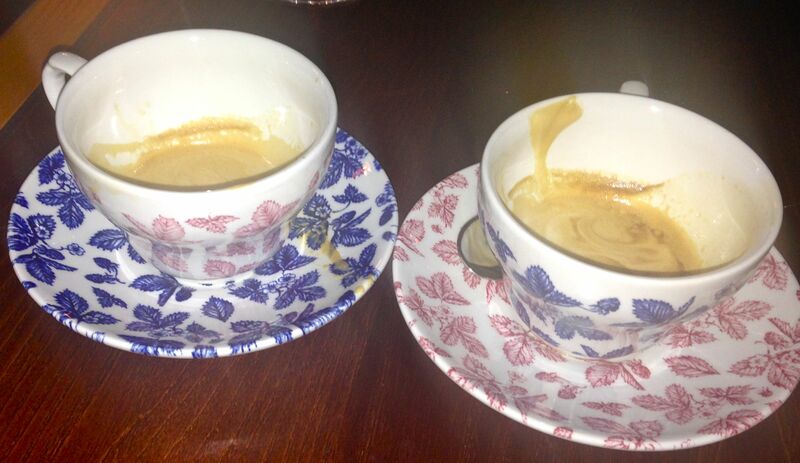 When I was in Italy recently I discovered the existence of macchiato – an espresso served with a little bit of milk. Okay, I’ve realised I’ve been rather slow in this discovery…but I’ve got there. A great finish to what turned out to be a rather large meal. Portions are extremely generous here, I reckon the pork could have satisfied two people and my starter was almost large enough to be a main. So make sure you go there hungry! Heddon Street Kitchen is at 3-9 Heddon Street, London W1.